Right-wing Prime Minister Benjamin Netanyahu has claimed victory after a closely contested national election in Israel. According to unofficial figures released by the Israeli election committee, Netanyahu’s Likud Party has won at least 29 seats in the 120-seat parliament, the Knesset, putting it in a strong position to form a ruling coalition. Likud’s main challenger, the Zionist Union, won 24 seats. Zionist Union leader Isaac Herzog has called Netanyahu to concede defeat. President Reuven Rivlin, a longtime Likud loyalist, will designate Netanyahu to form the next government once the distribution of seats is finalized among the ten parties that reached the threshold of 3.25 percent of the vote. Talks began on the shape of the next coalition well before voters went to the polls. Netanyahu has pledges of support from his own Likud, two other right-wing nationalist parties, Jewish Home and Yisrael Beiteinu, and, more conditionally, two parties of ultraorthodox Jews. These five parties combined will hold 53 seats, according to exit polls. Herzog heads the Labor Party. His partner in the Zionist Union bloc is former Foreign Minister Tzipi Livni, who heads the tiny Hatnuah party. Herzog had the assured support of only the Zionist Union, the middle-class “left” Meretz Party and Yesh Atid, the secular party of former TV newscaster Yair Lapid. According to exit polls, these three parties may win 44 seats between them. This would give the Kulanu Party, a split-off from Likud, the kingmaker role, with its ten seats bringing a new right-wing coalition to 63 seats, a narrow majority. Netanyahu has offered the finance ministry to Kulanu Party leader Moshe Kahlon, a former Likud cabinet minister. The parliamentary arithmetic is itself an expression of intractable contradictions within Israeli society. The parties comprising the Joint Arab List, which won 13 seats, making it the third largest in the Knesset, traditionally refuse to participate in government (nor would either the Zionist right or “left” form a government dependent on Arab support). The secular Yesh Atid backed Herzog as prime minister. It was Netanyahu’s firing of Lapid as finance minister and Livni as justice minister that broke up his previous coalition and precipitated elections two years early. 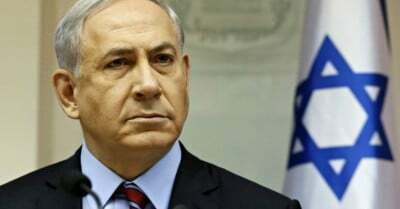 Two factors dominated the final days of the campaign: Netanyahu’s increasingly strident and racist attacks on the Palestinians, calculated to whip up his right-wing supporters, and the spineless character of his so-called “opposition,” which sought to profit from popular discontent with social inequality and the right-wing economic policies of Netanyahu, without offering an alternative. Netanyahu was clearly shocked by the deep unpopularity of his government revealed in opinion polls in the weeks leading up to the vote. The Likud leader fired Lapid and Livni last December and forced an election two years early in the expectation of an easy victory. But large sections of the Israeli public are weary of his constant harping on the alleged danger of an Iranian nuclear weapon. Netanyahu has been warning that an Iranian bomb was only months away for more than 20 years. His trip to Washington, where he addressed a joint session of Congress to denounce a prospective nuclear deal between Iran and the Obama administration, did not improve his poll numbers in Israel. In the final days of the campaign, Netanyahu shifted focus from Iran to the Palestinians, seeking, with some success, to lure the racist and settler vote away from Jewish Home and Yisrael Beiteinu. He publicly declared his opposition to a two-state agreement with the Palestinians. On Tuesday, he made an unusual Election Day appearance in Har Homa, a Jewish suburb of East Jerusalem built illegally on Palestinian land, to warn that his government was in danger from a reportedly heavy turnout among Israeli Arab voters. The Zionist Union offered only mealy-mouthed criticism of Netanyahu’s increasingly unhinged diatribes about external and internal security threats. Herzog himself boasted of his service as an officer in military intelligence. He and Livni criticized Netanyahu for aligning himself too closely with the Republican Party in the United States rather than working with the Obama administration. The Likud campaign portrayed Livni, whose father commanded a unit of the Zionist terrorist force Irgun and who herself served as foreign minister during the 2006 Israeli invasion of Lebanon, as soft on the Palestinians. In a direct concession to these attacks, the opposition announced Monday it was abandoning its plan to split the prime ministership, with Herzog serving the first two years and Livni then taking over. Zionist Union declared that Herzog would serve the full term, up to four years, if his opposition bloc led the next government. On economic issues, where Zionist Union sought to focus the campaign, the opposition offered little beyond highlighting the corruption and high living of Netanyahu and his unpopular wife Sara, who, according to one report, spent $24,000 on takeout food and $30,000 on hairstyling in a single year. Herzog was hardly a convincing vehicle for populist criticism of the corrupt Zionist establishment, however, since he is a product of it—the son of former President Chaim Herzog. He occupied several cabinet positions between 2005 and 2011 in governments led by Ariel Sharon, Ehud Olmert and Netanyahu. The increasingly acute socioeconomic contradictions within Israel find no genuine expression within the existing political structure, dominated by rival Zionist factions (and an array of nationalists and Islamists appealing to the Arab minority). According to a study by the National Insurance Institute, unemployment in Israel stands at 7.2 percent among men and 9.0 percent among women, both figures far above the overall 5.6 percent rate cited by the Central Bureau of Statistics. The new NII study asserts that previous estimates grossly undercount the number of involuntary part-timers, workers who want full-time work but cannot find it. Israel is one of the most class-divided societies in the world, with just 20 families controlling the bulk of the country’s wealth, dominating the share markets, and calling the shots in Israeli politics.